Hello Friends – I’m sorry if I’ve been M.I.A. lately. I’ve been quite busy at work and am just not feeling very motivated to blog, craft or do much of anything lately. I think my mind is already thinking of vacation but that is still several months away so I better get it together right? Anyway, I hope you’ve all had a great start to the month. My reading also seems to be going very slowly and I’ve had to set aside some books because I just wasn’t really into them. But hey, maybe I’ll find a good read in these latest books that arrived in my mailbox. Inside V by Paula Priamos. A former defense layer, wakes up in an empty hotel room to find her husband missing just days before he is supposed to report to jail for a heinous crime he swears he didn’t commit. Secrets of the Tulip Sisters by Susan Mallery. I’ve not read this author before although I’m sure some of you really enjoy her books. This looks like a good vacation read. The Ghosts of Galway by Ken Bruen. I think I watched an episode of the Jack Taylor series but wasn’t much a fan but I think I’ll enjoy the book a lot more. The Watcher by Ross Armstrong. A woman who is a keen bird-watcher who also can’t stop spying on her neighbors and witnesses something suspicious. Oh I bet this will be interesting! Have you received or bought any new books lately? What’s new on your shelves? 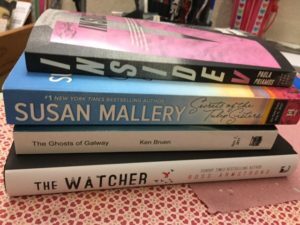 I’ve never read Susan Mallery either, but have placed her in the ‘vacation reading’ category, too. Hope one of these gets you excited about reading again. The Ghosts of Galway and The Watcher intrigue me! The Watcher sounds like good fun! I hear you on being busy at work and not feeling motivated to do anything else, I am there with you! I love thrillers! Will give Inside V a read. Nothing new for me; I am rereading books from my bookshelf.